Sometimes moody and tons of B&W just fits the session. This wedding shoot at St George Golf Club happened on a rainy Spring day, in a place so full of character. We couldn’t resist some romantic moodiness. Hope it inspires (love the rose gold trend) and shows you that rainy wedding day in Toronto can be beautiful as well. 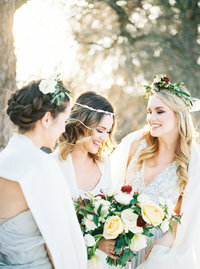 From Phoebe Lo Events…This magical day was captured in its bohemian spring elements, with a display inspired by the organic fluidity of poetry with a touch of elegance and luxury. The subtle interplay between soft textiles and delicate metals, further suggested by the fine array of artisan dyed linens and silk ribbon, all blend beautifully into a splendid palette of rose gold, silver and gold. Nestled upon the soft blush chiffon is an exquisitely crafted glass invitation suite, embellished with contemporary calligraphy produced by Velsie Mak. The elegant heirloom ring is presented by a handmade velvet ring box, custom made by Painterly Posies. The serene outdoors was the perfect place for a charming sweetheart table setting, with a rustic floral landscape arranged by Secrets Floral Collection. Al fresco fine dining against the majestic backdrop of St. George Golfing Country Club welcomes spring in a curious and fanciful way. Graced with a collection of fine china and delicate glassware from William Ashley, the rose gold cutlery delicately plays with the soft blush linen that further defines the coexisting vintage chairs for the couple seating. The soft palette of blush, ivory and yellow is encapsulated by the blooms and bouquets framing the scenescape. This romantic setting is accompanied by a collection of handcrafted artisan candles by Fenwick Candles, produced in an eco-friendly manner with all vegan materials and hand poured for each celebration. Our bride features two distinct wedding gown styles prepared by Ferre Sposa with accent accessories by LUVYT. These beautiful gowns and accessories were stylized by Jennifer Dang, with the charming look completed by Makeup Designer, Velsie Mak and Hair Designer, Puzzle Creations. The celebration is furthered by a collection of sweets and desserts by Sinfully Sweet Co. A rustic log cake celebrates the charm of the scene, paired with a more elegant triple layered cake. The thematic spring inspiration was represented by the natural sprinkling of spring showers, accented with the unconventional bohemian layout of the sweetheart table. In place of a traditional centerpiece, the tablescape design was defined by asymmetrical floral and greenery. 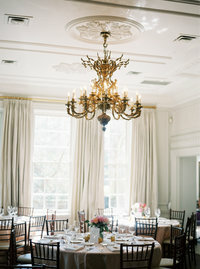 The castle-esque location showcases a variety of charming and unconventional spaces for wedding inspirations. From the age old architecture to the surrounding landscapes, each space embodied an unsurpassable elegance with very prominent notes of historical and bohemian pieces. Cake + Desserts: Sinfully Sweet Co. This place! We first discovered it when touring Eastern township and instantly fell in love. We needed to do a shot there! Fast forward to October 2016. It became a reality, thanks to an awesome team of vendors! Here is a poetic description of the day from our planner! We wanted to create an inspiration for an adventurous bride. A girl that spends her free time hiking in the mountains and camping by the bonfire. A girl that would take boots over heels anytime. What if she was to stay true to her real self on her wedding day. What if she was to put on an easy to wear dress, comfy boots, and even throw on her favorite hat. Her bouquet is inspired by wild flowers, the ones that the couple was admiring on their fist hike together. Low Maintenance, cheerful flowers just like our bride herself. She is ready for her mountaintop elopement with only closest family and friends. She is ready to promise to be forever adventures to the one her heart loves. This was one of those shoots that was born in my soul, for my soul. I am so grateful for a team of Halifax wedding vendors who came together to dream with me and make this a reality. Huge thanks to Wedding Sparrow Blog for the feature. Our shoot was inspired by a beautiful story of a Victorian heroine Grace Darling. Grace lived in a lighthouse on the Farne Islands in England with her father. One stormy morning she looked out from her window and saw a shipwreck. She woke her father up and together they went out into the rough sea, risking their own lives, to rescue the people, who were clinging to the rocks of, waiting for help. Her father climbed onto the rocks to examine the injuries of the survivors, and tend to their needs, while Grace stayed in control of the boat. In the terrible weather, Grace fought hard to stop the boat from getting too close to the rocks while her father helped the survivors. One by one, the survivors were helped onto the boat, until all of them were safely on board. Grace and her father took the survivors back to the Longstone lighthouse, where they tended to their wounds and cared for them for 3 days until the storm finally passed. Grace became nation’s heroine, with tales of her bravery even reaching Queen Victoria. In our shoot, we wanted to portray a brave spirit and a beauty of a simple humble village girl. Because we believe that real beauty comes from putting other’s first and being always ready to help those in need.